Completely revised and expanded, the Third Edition covers the numerous improvements in sealant and adhesive technology since 1984. Features the latest advances in sealants, gaskets, tapes, waterproofing membranes and silicone structural sealant glazing. Includes new chapters on insulating glass sealants, structural silicone adhesives and membrane waterproofing. Revises and supplements existing specifications with upgraded recommendations and proposed performance requirements where standards do not exist. A guideline for architectural specifications covering sealants, fire stops, membranes and coatings is included for the first time. As always, the latest ASTM Committee sealant standards are included. 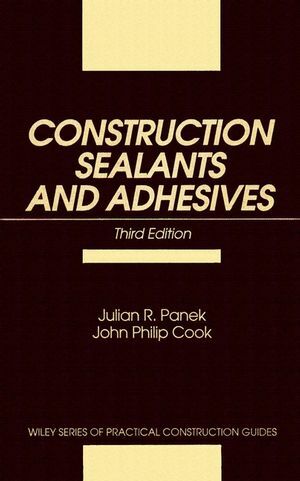 Julian R. Panek and John Philip Cook are the authors of Construction Sealants and Adhesives, 3rd Edition, published by Wiley. Stresses and Strains in Sealants. Seals for Bridge Expansion Joints. Adhesives as Binders for Composite Materials. Adhesives for Concrete, Cement, and Plaster.